Finding a cheap hotel Melbourne can be easy or not so easy, depending on when you want to stay in Melbourne. If you are visiting Melbourne for one of its major events like the AFL Grand Final or the Melbourne Cup, you must book months in advance to be able to get any budget hotel Melbourne. Also, during the school holidays it can get busier. So these are the times you need to book your Melbourne hotel ahead of time. However, if you are planning to stay in Melbourne off-season and away from any special event that draws large crowds, you can leave your Melbourne hotel booking till last minute. Here is a list of the best cheap Melbourne hotels. How to Get Cheap Hotel Melbourne Rates? The Melbourne hotel market, like anything else, is demand driven. Each hotel, for each of its rooms, publishes a rack rate. This is the term for the full price of a hotel room. It is ordinarily quite inflated and rarely charged. However, the rack rate is what you tend to pay when you walk in off the street, asking for a room. For this reason, whether to book ahead, or for last minute hotel bookings, it is much better if you book online. Hotel rooms are discounted. Rather than having their rooms empty hotels often drastically  by as much as around 50% - reduce the rack rate. When you are looking for a cheap hotel Melbourne or to make a hotel booking online, you get to see the rack rate as well as the discounted rate for that particular room at a particular day. You can compare or book various hotels here. After entering your travel date, when comparing these Melbourne hotels, make sure to sort the search results by price. If you just search for the lowest Star Ratings, you might miss higher rated but discounted hotels. While Star Ratings are an indicator of the quality of a hotel, they are not necessarily a surefire indication of price. You can actually often get higher rated hotels that have been heavily discounted, just as cheap as the lower star cheap hotel. Depending on the season, you can get a 4 star hotel just as cheap as a 3 star hotel. So, as long as you spend some time shopping around online before you travel, you can get quiet nice hotels at discounted rates. Where do You Want to Stay in Melbourne? There is a good range of discounted or cheap Melbourne hotels, as well as guesthouses, budget hotels and backpacker hostels. An important decision is where you'd want to stay during your time in Melbourne. Would you want to be in the middle of it all and stay in one of the cheap hotels in the Melbourne CBD? Even there are differences, each area of the city giving you a different subculture and access to different venues and facilities. Or would you want to get away from the hustle of the city and stay in cheap Melbourne hotels towards the south - South Melbourne, South Yarra or the popular St Kilda near the beach? These areas are trendy but also give you access to the Botanic Gardens and the Bay. 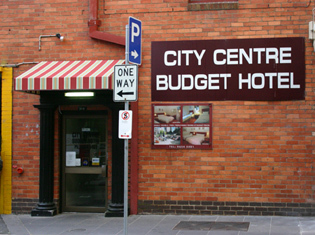 There is also a range of cheap hotels in Melbournes East. Some of these are in the classy area of East Melbourne, close to the MCG and Melbourne sports venues. Others are in the trendy shoppers paradise of Richmond, and some even further afield. There is also cheap accommodation towards the North of Melbourne. This gives you access to the Melbourne University or the bohemian inner city precincts. There are also a few really cheap hotels further in the suburbs. So in order to create the stay that you envisaged, finding your best cheap hotel Melbourne may require some research. You can always compare you hotel prices here, or for a bit more comfort, check the rates of the mid range Melbourne Australia Hotels here.